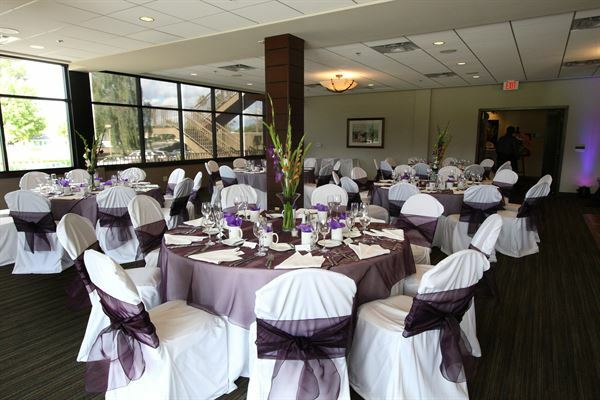 Reception Packages Include: • hors d’oeuvres • fresh garden salad • locally sourced rolls and butter • entrée of your choice • children’s menu • bar package • champagne toast • coffee service • round dining tables • high cocktail tables • house white linen • cushioned dining chairs • white china • flatware • glassware • service staff Please see attachment for additional information and menu options. This 3,700 square foot room can be used as a whole room or it can be divided up so you have 2 rooms in one. The outside terrace is adjacent to the ballroom that allows for indoor/outdoor functions. It’s an ideal setting for corporate meetings, breakouts and a luncheon or dinner or uses the whole room for a holiday party or special occasion. Celebrate your wedding at this beautiful historic golf club, where stars and golf professionals have walked and loving couples continue to be drawn for a memory of a lifetime. Lush golf course, surrounding mountains and night-lit fountain create the best backdrop for photos in town. You just have to see this property!